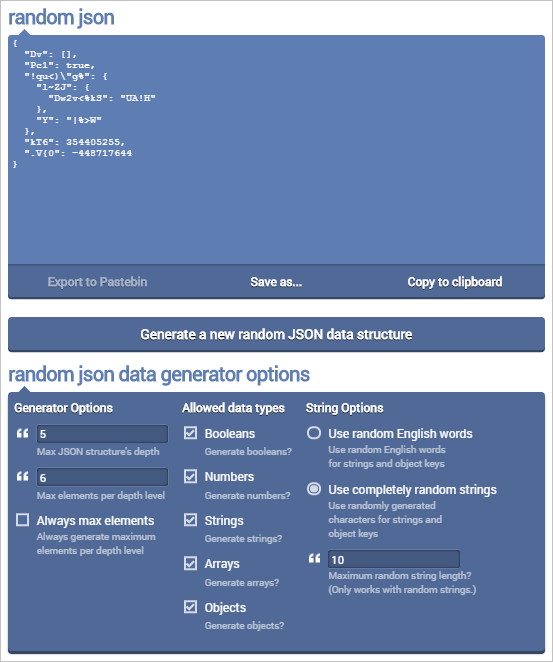 Yesterday I wrote a random JSON data structure generator for my next site Online Random Tools. Here's a quick article about what my thought process was when I was writing it. This function will sometimes cause a stack overflow because we haven't limited the depth of the JSON data structure. We can easily do that by passing maxDepth as an argument and avoiding generating nested JSON substructures when it's 0. There are many more improvements that can be made, such as passing options for max string length, max number to generate, max number of elements per depth level, etc. I've implemented all these in Random JSON Generator online tool that you can try. Clear thoughts lead to clear code. See you next time!